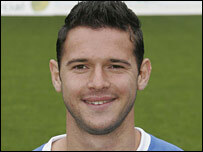 Gillingham chairman Paul Scally has revealed that Charlton are interested in want-away winger Matt Jarvis. The 20-year-old is out of contract and will be free to leave Priestfield this summer, although the fee would be set by a tribunal as he is under 24. However, Scally believes the player's agent has already struck a deal with an unnamed Championship club. "We have had interest from Charlton, which I'm discussing with his agent," Scally told BBC Radio Kent. "But that's as far as it's gone. If he was in contract, I think he'd be worth £2m. "And if he continues his development, I believe he'll play for England within the next three or four years." Jarvis rejected Gillingham's offer of a new contract earlier this summer, while Nottingham Forest and Plymouth have also tried to sign him.